Locally, more than 4,300 pounds of nonperishable items were collected during the two-week drive, which ran from November 2 to 16. Dallas team members prepared the items for the North Texas Food Bank to distribute to families in time for the holiday. “During this special time of year our team enjoys getting involved and giving back. We have so much to be thankful for and this is a nice way to show others how much we care. The team stepped up again this year to make a difference,” said Ken McDonald, Dallas Division President. In Dallas, the Thanksgiving Drive benefitted the North Texas Food Bank, an organization that provides access to more than 170,000 meals each day for hungry children, seniors and families through a network of more than 1,000 programs and 200 partner agencies in a 13-county service area. "We would like to extend our heartfelt gratitude for the efforts of David Weekley Homes. Your participation and hard work in the struggle against hunger is commendable and greatly appreciated by more people than you may ever know. It is always a humble pleasure to work with such dedicated individuals in pursuit of solving the far too urgent problem of food insecurity,” said North Texas Food Bank representative Doyle Carnahan. 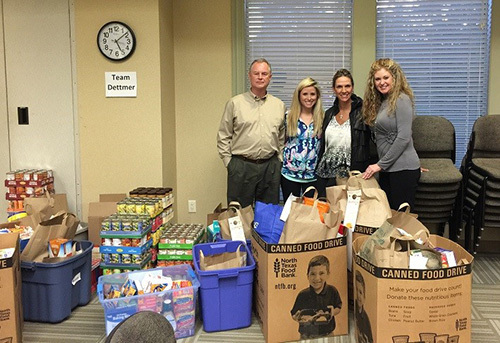 Team Members from David Weekley Homes donated more than 4,000 pounds of canned and nonperishable food items to the North Texas Food Bank to benefit families in need. The North Texas Food Bank (NTFB) is a top-ranked nonprofit relief organization, providing access to more than 170,000 meals each day for hungry children, seniors and families through a network of more than 1,000 programs and 200 partner agencies in our 13-county service area. In fiscal year 2015, NTFB provided access to some 63 million meals but the need for hunger relief in North Texas today is much larger.